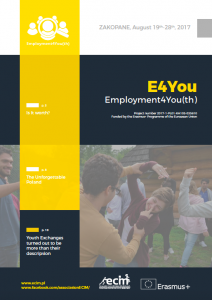 Project Employment4You(th) was a response to the existing needs of the youth sector, whose representatives from 8 different countries declared their will of contribution in order to improve their and their peers’ situation in the labour market. The main activity of the project – the Youth Exchange took place on August 19-28, 2017 in Zakopane, Poland. 40 young people were involved from the very beginning in creating the project together and fulfill it with the great content that lead them to achieve their goals, including also acquirement of many different skills useful on the labour market. To see more about this beautiful learning adventure go further with reading this brochure, which is one of the results of our common work within „Employment4You(th)”.